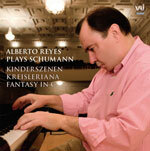 Alberto Reyes celebrates the Schumann year with performances of the major piano works. “Kinderszenen”, Op. 15; “Kreisleriana”, Op. 16 and “Fantasy in C major, Op. 17”. from “Gramophone”, BBC Music Magazine”, “International Piano”, and other major publications.